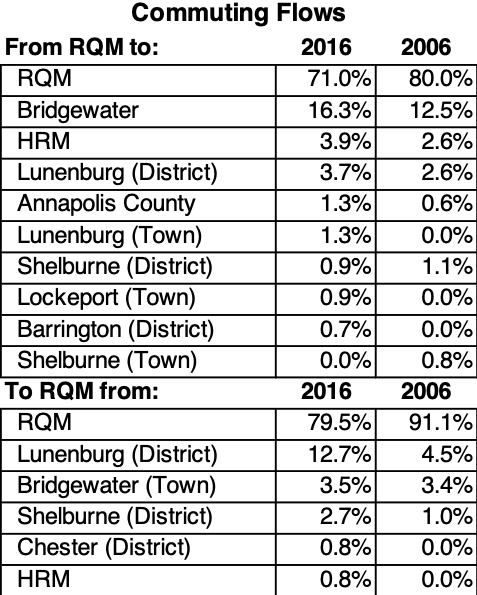 The Region of Queens (“RQM”) has an employment profile that is generally typical of both the broader region (Queens County + Lunenburg County), and the province as a whole. These rural economic areas are specialised predominantly in natural resource and food production industries, and manufacturing. The addition of employment in construction, retail, hospitality, and public services (education, healthcare) at typical proportions forms the bulk of the Region of Queens’ economic base. Labour forces and employment opportunities are not constrained to municipal boundaries. Commuting flows can help illustrate the degree to which the Region of Queens is integrated with broader job and labour markets. The tables to the right show the proportional distribution of work commutes; first by Region of Queens residents to the location of their place of work (i.e. job market accessed by residents), and second by all workers to places of work in Region of Queens (i.e. labour market drawn on by employers). Increasingly, residents are finding employment in neighbouring municipalities, predominantly those east of the Region of Queens. This indicates that the municipality is part of an integrated job market focussed towards Lunenburg County, but also benefits of employment opportunities as far away as Halifax.